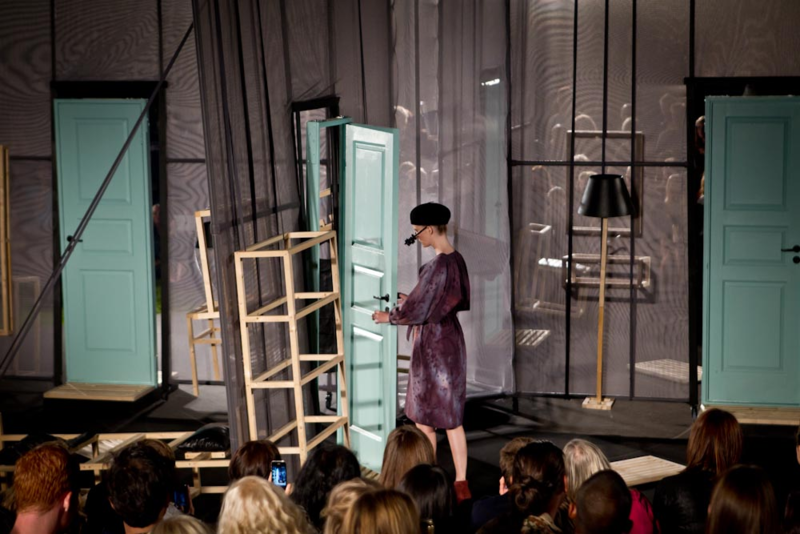 Danish artist Henrik Vibskov known for his avant-garde fashion designs, as well as art installations and music (as the drummer for the Danish group Trentemøller — and one of my favorites…) always puts on a show to remember during Copenhagen Fashion Week. This year was no different. 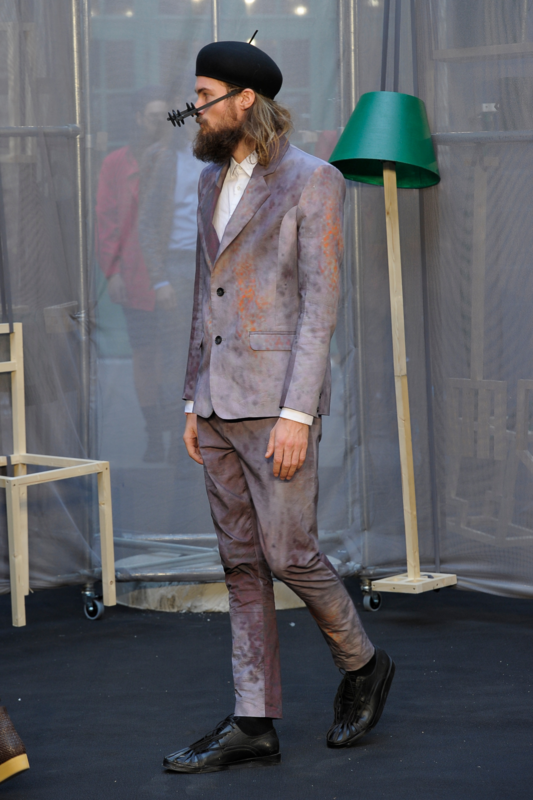 In his spring/summer 2012 collection he combines influences from “Clockwork Orange,” Steve McQueen, and 19th century artisans, miners and carpenters. See below some of the images from show. Known through the Benthamian concept of a circular building that plays with observation and self-observation, the word Panopticon derives from the greek “panoptus“, meaning fully visible, all-embracing in a single view. Taken out of the context of strict surveillance and control it was originally intended for, the circular “Panopticon And On“ stage re-arranges and subverts elements of this structure. The SS12 collection itself plays with details from 19th century artisans, miners and carpenters. Apart from these more clear references, the pieces emerge from a very free spirited frame of creativity. Among the inspirational elements of the collection are a long list of arty nonsensical mechanical objects, children’s books illustrations, imagery from films like “Delicatessen” or “Clockwork orange”, and Steve McQueen. The name Henrik Vibskov is most commonly associated not only with a fashion label, but a multitude of twisted yet tantalizing universes created in relation to each collection. As a fashion designer Henrik Vibskov has produced Seventeen collections since he graduated from Central St. Martin’s in 2001, and he is currently the only Scandinavian designer on the official show schedule of the Paris Men’s Fashion Week, which he has been since January 2003. 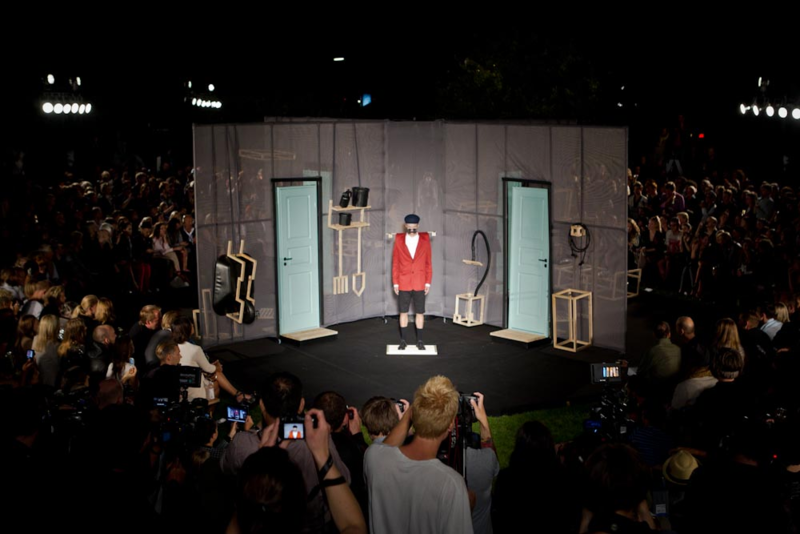 Since the beginning of his career Henrik has frequently been invited to and participated in festivals, contests and talks such as Swiss Textile Awards 2003 where he ended up in the finals, Hyères Festival 2003 and 2004, Expo 2005 japan, Noovo Festival 2007 in Santiago de Compostella, Design Week 2008 in Monterrey, Mexico and NOTCH Festival 2009 in Beijing. Although Henrik has a principle of never giving away clothes to celebrities for commercial purposes, people like M.I.A., Devandra Banhard, La Roux, Kanye West, Bjørk, The Arctic Monkeys, Sigur Ros, Franz Ferdinand, and Lou Reed have all been spotted in Henrik Vibskov’s designs. Between designing new collections biannually and creating the universes surrounding them, Henrik keeps himself occupied Touring the world as the drummer for electronic musician Trentemøller, and exhibiting at art museums and galleries around the world. 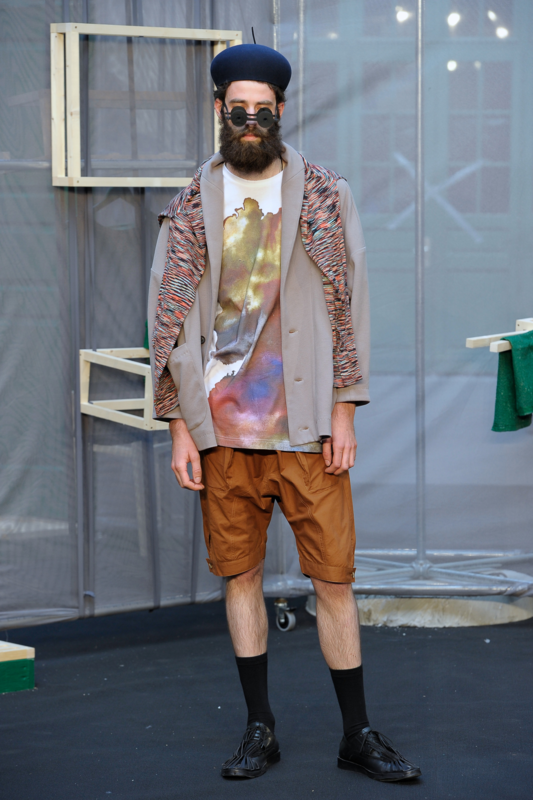 Henrik Vibskov’s collections are sold only through thoroughly selected shops across the globe. Seven in New York, Midwest in Tokyo, Aloha Rag in Hawaii, Spr+ in Amsterdam, Traffic in Moscow, Mue in Seoul and his own Henrik Vibskov Stores in Copenhagen and Oslo are a few of the most influential stores, but lately countries like Saudi Arabia and Kuwait have embraced Henrik’s designs. Through his career Henrik’s designs have won him prizes such as Beck’s Student Future Prize 2000, Danish Design Council Award 2007,Brand of the Year DANSK Magazine Fashion Awards 2008 and Danish Art Council’s Design Award 2009.